Just a quick update for those that have been, like me, waiting for this moment. 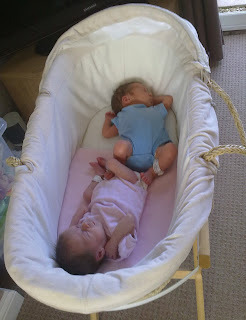 M was given the all clear and was allowed home with the twinnies on Saturday. It's just so lovely to see the little family learning to get into their routine. It's been a really eventful couple of weeks but it was all worth it for this moment. I just want to wish them so many special happy family times together. Yaaaaaaaaaayyyyyy!!! What a gorgeous picture. Congrats to all. So glad everyone is now home together and can start being a family again. Cute photo. Did wonder if you did alterations by post!! What a fantastic photo Annie and as you say also the fab new that we’ve all been waiting for. I wish them all the joys of settling into a ‘normal’ life at long last. They look so sweet! Congratulations to everyone! AAWwwww! Love other people's babies! Hip hip hooraaaaayy!!!!!! Fantastic news and I wish them all every happiness and continuing good health. love the pics. That's what I needed today the image of two babies sleeping peacefully in their cot absolutely oblivious to the drama that unfolded around them and will hopefully soon fade into a horrible but distant memory. You'll never forget but it looses its sharpness with time. Brilliant news - so pleased for you all. That's fantastic, Annie. I'm so happy for you all. wONDERFUL PHOTOS. Time will fly for you with all your projects and excitement with the precious little ones. Enjoy it. Ohhhhhhhhhhhhhhh. So teeny tiny and so gorgeous! Am so glad to read the good news. And also that the Wipso sewing is glong postal! Yay :D next stop - global! I'm all Verklempt here!!! What a wonderful picture and such gorgeous babies! So awesome the way all has worked out...couldn't ask for anything better! Welcome Home!!!!! !